Where do I use my Thompson and Morgan voucher code? At Thompson & Morgan, you’ll find a variety of garden products including flowers, plants, bulbs, shrubs, vegetables, fruit and seeds as well as a tool shed, outdoor living products, buildings, fencing and wild bird food. You can also shop via the special offers section to find an array of discounted products and for help and advice, there’s always the gardening tips section for you to have a look at. Whether you’re shopping for bedding plants, roses, sweet pea seeds, shrubs, onion and leek seeds, potatoes, strawberry plants, vines and climbing fruit, bird feeders, seeds or accessories you can find it all at Thompson & Morgan. You can also ensure that your garden’s kept in the best condition with garden tools and equipment, garden machinery, plant pots, fertilisers, plant protection, hanging baskets, pest control and garden irrigation and watering. If you spend a lot of time outdoors you can find garden an array of furniture such as benches, parasols, dining sets, barbeques, fire pits, water features, patio heaters and garden storage. There’s also a wide array of building and fencing including garden sheds, greenhouses and garden screening. Thompson & Morgan stock a wide array of award-winning seeds and plants. From pea and bean seeds to the unique and exciting plants available online, the accolades have been coming in quick for Thompson & Morgan over the last few years. From stringent trials to reader-voted awards and victory at the world-famous Chelsea Flower Show, Thompson & Morgan’s determination to offer the best products in the gardening industry has earned the Suffolk-based company a clutch of prestigious awards. These awards include 'Plant of the Centenary’, ‘Best vegetable seed range’, ‘Which? Gardening Best Buy’, ‘Plant of the year’ and ‘Best new plant variety’. There’s a huge array of plants, flowers, shrubs, seeds and tubers available at Thompson & Morgan including potted plants, annual plants, bedding plants, clematis plants, dianthus plants, geranium and pelargonium plants, house plants, sunflower seeds, poppy seeds, petunia seeds, begonia tubers, daffodil bulbs, tulip bulbs, hyacinth bulbs, shrubs, trees, hedging plants and much more. All of the flowers, shrubs, plants and seeds available at Thompson & Morgan are extremely affordable and of the highest quality, many of which have even won awards at prestigious events such as the Chelsea Flower Show. 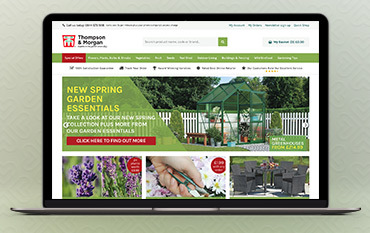 If you’re looking to fill your garden with beautiful flowers, plants and accessories but are working on a tight budget then take a look at the special offers section on the Thompson & Morgan website. There’s great percentage discounts available as well as multiple multi-buy offers including buy 4 get £5 off, 5 for 4 on all seeds, 4 for 3 on hardy plants, over £50 off perennials and buy 2 get packs of garden ready plant packs for just £7.50. All these great offers change regularly so you are sure to find new deals every so often, allowing you to fill your garden with a diverse range of beautiful flowers every month. Larger items will incur a higher delivery charge - this will be displayed in your shopping basket when you come to check out. To cancel your order please click here. Unfortunately, Thompson & Morgan are currently unable to amend payment details or other order details once an order has been submitted. Based in Ipswich, Suffolk since 1855, Thompson & Morgan is the UK's most successful horticultural mail order company. Its product range includes an award-winning choice of seeds, young plants, bulbs, seed potatoes, onion and garlic sets, soft fruit and fruit trees, as well as an extensive range of gardening equipment and outdoor living products. Shop online with a Thompson & Morgan voucher code from us and save money on your order, you can also enjoy great discounts in the special offers section on the Thompson & Morgan website.